In most countries people will think about parking cars when they read the headline. In the Netherlands there is also a shortage of parking space for bicycles. Even though bicycles take up far less space than cars, when you reach a certain number finding a place to park can become difficult just as well. Especially around popular destinations such as main train stations, universities and shopping areas the number of parked bicycles is so high that regulation became necessary. Around stations you are not allowed to park your bicycle for more than 30 or 14 days. This may sound like a long time, but we should perhaps explain how the Dutch behave. The Dutch on average have more bikes than one. Many of those extra bikes are bikes in other cities. A Dutch student may buy an extra bike for around 50 euros to reach an internship or an extra schooling course and park it at a railway station. When the course is finished these bikes are often abandoned. The Dutch call the abandoned bikes ‘weesfietsen’ or ‘orphaned bicycles’. Bikes without an owner clog the much needed parking spaces so the city councils come up with ideas to find those bikes. Labels are used to tag bikes. If you don’t remove the tag within 30 days obviously you haven’t used your bicycle. Those bikes are then removed. But this system consumes a lot of time and resources of the cities. Now electronics come to the rescue. The Dutch have found a way to monitor the parking time for every single bicycle. A trial is running at the railway stations in Utrecht and Groningen. Not coincidentally two cities with a major university and high bicycle use. ProRail, builder of Dutch railway infrastructure including the stations with all facilities, so also bike parking, has equipped bicycle parking racks with a detection mechanism. The moment a bike is parked the switch detecting that sends a wireless signal to a local receiver that sends it to a central computer using the internet. That computer registers date and time of parking and sends it back to the operator in the bike parking facility. The operator can monitor where bikes are parked and for how long. If a bike was parked more than 14 days earlier the operator gets a message to remove that bicycle. Owners can get them back from the council after paying a fine. Added bonus: on screens at the entrance the number of free spaces for certain sections in the parking facility can now be shown. So parking your bike will not be the usual long search for that final open space. The system costs ProRail about 100 euros (146 US$) per parking space. But it hopes this will be reduced once the system is installed in more places. Dealing with the high number of parked bicycles is a big challenge all over the Netherlands. But it is of course a better challenge to have than having to deal with parked cars. The blog has many posts about bicycle parking. which runs from the South to the North East is the railway. 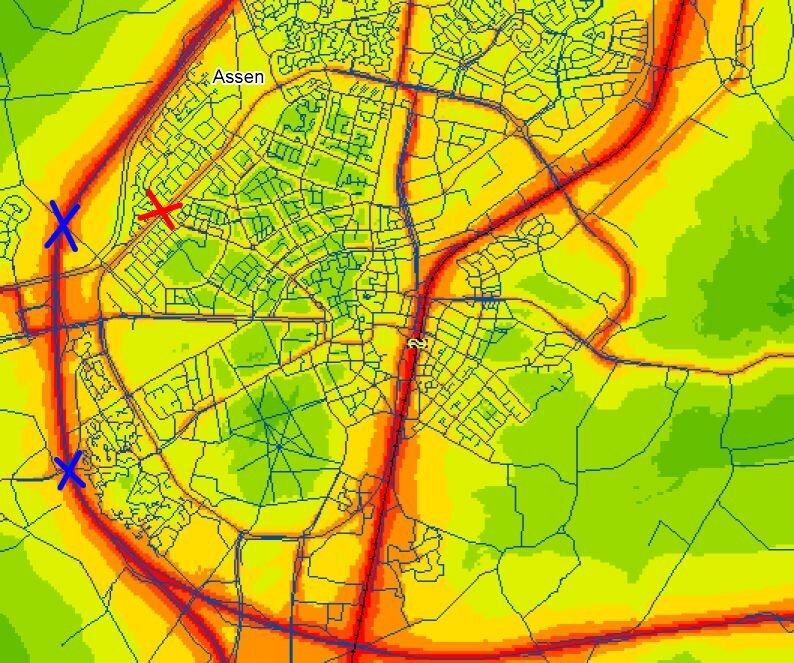 The noise map on the left shows noise levels in Assen. From the 1970s onwards, research lead to several generations of quieter surfaces for Dutch motorways so that the noise pollution from them is less than it could be, and that it does not spread widely. There are also lower speed limits on Dutch motorways where they pass near residential areas, and barriers alongside them to block the sound. 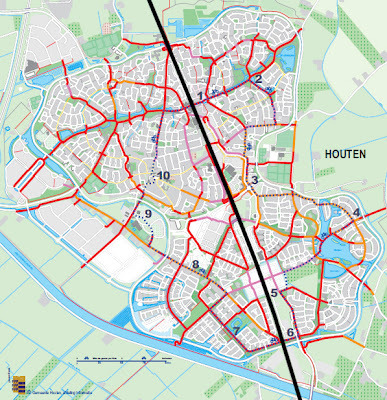 The red cross on the noise map of Assen is the position of noise barriers featured before on the blog. The blue crosses are where we've stood with people on Study Tours to demonstrate that while the A28 motorway (the main motor vehicle route North-South) is the noisiest road in the city, you can still be remarkably near to it without having to raise your voice to be heard. This is actually a remarkable difference from the thunderous roar which is normal for people living near some British motorways, though as you can see on the map, they are still a greater source of noise than anything else. However, noise is also used in another way. While motorways have been made quiet, many residential streets do not have these super smooth quiet surfaces. Many of them have rather rough cobbled surfaces as shown in this photo. It's traditional, and looks really nice. Such a surface is also noisy to drive a car on. I have never seen anyone say that it is deliberately kept this way, but it is interesting that in the Netherlands if you go on a long journey in a car then the road noise inside the car is relatively low compared with the noise inside when you come off the motorway and drive much slower on residential roads. The opposite problem occurs in other countries, and is sometimes pointed out as a reason why drivers might speed when they come off the motorway - because they've become used to the noise level while driving faster. These cobbled streets are often on cycle routes. Cycle routes on roads frequently don't follow the same line as car routes. Rather, these "shared" roads have very few cars on them, because the roads have 30 km/h speed limits and the direct through route is only usable by bike or on foot. Often one way restrictions applying only to motorized vehicles are used to make sure that a cyclist using a back street won't see motorists competing to also use it as a through route. "Rat-running" is virtually eliminated. Forcing drivers to take different routes to the direct routes taken by cyclists is a way of keeping cyclists safe from drivers without cycle paths. However, because these cobbles are rough, they're not the best surface for cycling on. There is now a new type of cobble, as shown on this "bicycle road" in Assen (A "bicycle road" formally allows cycles in preference to drivers). These special square edged cobbles have the aesthetic of the traditional type, but they give a smoother ride, nearly as smooth as asphalt or concrete. This bicycle road forms the most direct route into Assen from a new suburb (as seen here and here). The special cobbles are a little more expensive, but considered to be worth using because they keep the historic centre of the city looking good, while also giving cyclists a better than average, more comfortable, surface on which to ride. In the past, cycle paths in the Netherlands were surfaced with cobbles, and sometimes these were not pleasant to ride over. Replacing older cycle paths is a continuous process and many have now been resurfaced. Modern surfaces are either very smooth asphalt, as in this photo, or concrete. It's not uncommon for cycle paths alongside a road to have a smoother surface than the road itself. This is the case for a good part of the route between here and Groningen, where the cycle path is concrete while the road is asphalt. The concrete surface offers not only smoother riding, but also lower rolling resistance and higher speeds for cyclists vs. riding on the road. You also see this done quite deliberately in the countryside. 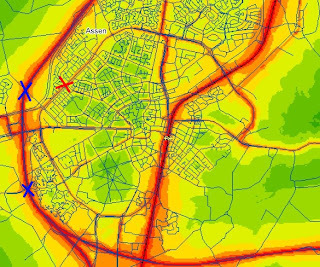 The noise map comes from this remarkably comprehensive website about traffic noise. The safety for cyclists increases every year in the Netherlands. "With these figures the Netherlands holds its position in the leading group of the safest countries in Europe. Regarding the percentage of decline: this is in line with other countries for which figures for 2010 are known at the moment (on average 10% lower than 2009). It should be noted that the number of deaths per 100,000 inhabitants in the Netherlands is considerably lower than in most other countries. This adds additional weight to the decrease in 2010." ''There was a notable slight rise in the number of pedestrians killed in 2010: 72 pedestrians died, of whom over 60 percent were aged 50 years or older. Pedestrians were the only group of road users for whom the number of deaths did not decrease." In a reaction the ANWB (motorists organisation) called for a separate investigation into the reasons of the increase of the number of deaths for this vulnerable group of traffic users for which there is no apparent cause. And the spokesperson feels the country should do even better: “The goal is to decrease the number of deaths to 500 in 2020. But we feel it is possible to go further than that, a decrease of 50% in 10 years. So from 640 deaths in 2010 to 320 in 2020”. In her letter the minister also notes that she “brings this message with mixed feelings, as 640 deaths still mean a great deal of sorrow”. But still it is good news that the number of especially younger and older cyclists decreased significantly. To be perfectly clear: that is the number for the whole country in the entire year. In 1972 the Dutch population was 13 million compared to 16.5 million in 2010. 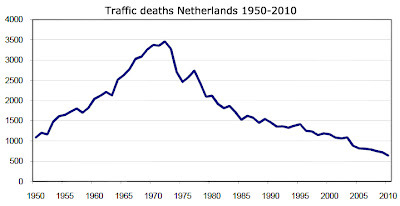 Looking at all the information it cannot be a coincidence that from the mid 1970s the people of the Netherlands stood up for the most vulnerable road users and separate bicycle infrastructure slowly became the norm. "To determine the number of traffic deaths in the Netherlands CBS analysed data from three sources: data from the death certificates physicians complete with the cause of death and records of the district public prosecutors on non-natural causes of death, complemented with accident reports by the police. By linking and comparing these sources CBS determines the figure of traffic deaths. The vast majority of deaths is based on forms prepared by doctors and the files of district public prosecutors. The additional police figures supplied Statistics Netherlands in 2010 with six additional road deaths, which is 0.9% of the total. This number varied during the period 2003-2009 between 17 deaths (2003) and 3 deaths (2008). These deaths involve in particular persons who had a traffic incident in the Netherlands but who deceased abroad. The number of traffic deaths does not disclose the amount of accidents nor the number of victims injured in an accident. " While it's true that deaths are on a downward trend in the Netherlands, it's rare that you can completely trust press releases. Please also read about how this downward trend reversed in 2011, and the surprising reasons why. Cyclists and pedestrians elsewhere often feel that their time is wasted by pedestrian and cycle crossings which are timed in such a way that they prioritize "keeping traffic moving" over people who want to cross roads. This often causes people to cross against a red light, especially if they are in a hurry. Here in the Netherlands, timings are quite different. This video shows a crossing on the route to school taken by my youngest daughter. The maximum delay is eight seconds. Therefore she never has to wait too long for a green light and I am happy that she is never tempted to cross while the cars are still moving. Assuming that the junction splits time 50:50 for the two different directions, and that there is a 1 minute cycle time, a motorist can expect to be delayed a maximum of 30 seconds. Half of drivers are not delayed at all as the light is already green, and the other half are delayed by an average of 15 seconds, making an overall average delay of just 7.5 seconds for a driver. On the other hand, a pedestrian only gets to cross if they walk right up to the crossing and push the button. Typically, the green phase for a pedestrian will last as little as 3 or 4 seconds, fitted into the 1 minute cycle. What's more, there is an initial use delay on the button intended to make pedestrians bunch up. The intention of this is to make best use of the this short time and "keep traffic flowing" on the road in the meantime. So, you push the button. Wait, say, 10 seconds, then have an average delay of (60-4)/2 = 28s. As a result, the average delay for a pedestrian is 38s. That's 8s longer than the maximum for a driver or 5x as long as the average for a driver even though they are subject to the same cycle time. Now I know that some people will say "it's just a few seconds", but let me explain further. At one time I would walk my children to primary school, then return, walk again to collect them, and return again, using this crossing four times a day. That means that on average the pointless extra delay would consume one and a half minutes each day. That's about as long as it would have taken to make one of the journeys by car. I literally worked the numbers out while waiting for a green light to show. Other examples in Cambridge were even worse. This junction was built next to a new development near us while we lived in the city. It's a less major junction than the large junction shown in the video above, but it's far less convenient for cyclists or pedestrians. At this junction, drivers have one set of traffic lights to wait for with the timings generously set up for them, average delay of around 7.5 s as worked out previously. However, pedestrians and cyclists on the shared use path had to use up to four (never fewer than three) light controlled crossings just to cross one road. I wrote about it as soon as I saw a copy of the plan. Complaints had no effect. It was implemented exactly as in the plan. As you'll have seen from today's video, it's really not the same here. Cyclists often get to avoid traffic lights altogether so you see far fewer of them than if you drive. However, when you come to a traffic light it will work well for pedestrians and cyclists and not cause you to feel like a second class citizen due to a ridiculous delay. Almost always the junction will have started counting before the button is pressed because it is normal to have both a loop under the ground and a button at junctions. Sometimes such crossings are even set up so that the light defaults to green for the cyclist. Peter Miller also wrote about delays at a pedestrian crossing in the UK. 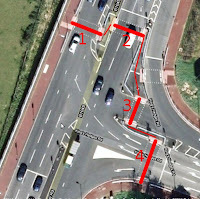 Note that the junction at the top also allows cyclists to take a short-cut which isn't open to drivers. This is an example of how unravelling of driving from cycling routes encourages cycling by making it more convenient than driving. Of course, some traffic lights in the Netherlands are not so ideal. But I've yet to find one which appears to be set up specifically to annoy pedestrians as sometimes seems the case in the UK. The day after this post, Gaz545 wrote a response which shows "Delays at crossings in the United Kingdom". This video was made on Monday afternoon two weeks ago when I rode to the German border and back. I made the journey because we've a holiday customer coming in a couple of weeks who will take this route. I realized I had not ridden it for over a year, and it's important that we keep our routes so up to date as possible. Bourtange itself is a star shaped fortress and village dating from the eighty years war between 1568 and 1648. At the time it was militarily important and guarded the only road between Germany and Groningen. Now it's a museum. On the way to Bourtange I stopped a couple of times, to eat sandwiches, to take a look at some willow trees, to look at a deserted beach (Monday afternoons in April are not peak times for sun-bathing). I didn't really need to carry on from Bourtange into Germany, but I thought it would be nice to have a German beer at the furthest point from home before turning around again. However, the owners of the cafe I stopped at had other ideas. It was shut. I've called past the same place several times now, and never managed to get any refreshment at all. Anyway, that was the furthest I had any reason to ride, so I turned around and headed home again. A 120 km afternoon bike ride, including a trip back in time and to visit a foreign country, a few stops for food and drink and to take photos, and I was back in time for dinner. Today I finally got around to taking off the winter tyres on my Mango and putting on summer tyres. Marathon Plus tyres are some of my favourite tyres. I've used the same pair on the front of my Mango all through the last two winters, and another on the rear this last winter, apart from when it was icy and I rode with a Marathon Winter studded tyre. They're fantastically reliable, and virtually impossible to puncture. The whole family has these tyres on at least one of each of our bikes, and in many tens of thousands of km none of us has ever had a single puncture with the Marathon Plus. They're really great tyres... but... you can probably see where this is going. Having to fix a puncture in the middle of winter is downright unpleasant. I'll put up with a slightly heavier / slightly slower tyre to avoid this happening. The pub with no beer. Again. However, it's not winter any more ! I've taken off the heavier, slower tyres off and put narrow Continentals on the front and the reliable and fast folding version of the Marathon Racer on the rear. Including the inner tubes, this combination weighs just under a kilogram. The three Marathon Plus tyres and their inner tubes came to more than 2 kg. This kilogram different is not just static weight either, but rotating weight, all of it near the outside edge of the wheel. Reducing this makes a big difference to acceleration. Lighter, faster tyres are more fun to ride with - just what's needed for summer cycling. It's like having a new, lighter, faster bike, every spring, and best of all this comes free of charge. You have to replace tyres eventually, when they're worn out. All I've done is to have a second set which I use for warmer months. The tyres which came off today will go back onto the bike next winter, as again I'll to looking to avoiding the possibility of fixing punctures in the snow. There now seems to be a huge difference in sidewall construction between the wire bead and folding versions of the Marathon Racer tyre. I worked in Groningen yesterday. This meant I didn't get to watch the first stage of the Ronde van Drenthe as it took a winding path between Coevorden and Hoogeveen which included passing through Assen. I had the local radio station on at work and could at least listen to it - the coverage was punctuated by some of the the surprisingly large number of Dutch songs about cycling. Here the peloton appears, riding at speed along the south side of the Vaart (canal). Alice's view from the other side of the canal. The top three in the first stage were Kenny van Hummel, Sacha Modolo and Adam Blythe. You can see full results here and more photos in Judy's Picasaweb album. There are also women's races, which didn't come through Assen this year. However, there are some nice photos here of the womens' race, including climbing a hill on the route. See also a video of a completely different event at the same location. A very annoyed cyclist from Amsterdam requests fellow cyclists to accompany him in noting license plates of vehicles that are illegally parked on the cycle path. He wants to try to get the drivers prosecuted. And he hopes that might also be possible for pedestrians. With all those intruders on the cycle path he is starting to wonder for whom the cycle path is anyway. "Hang on" you might ask, "in Amsterdam?". Yes, that's right, even in Amsterdam! 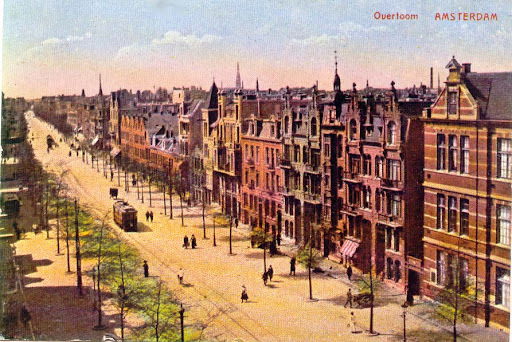 This was the first year the cycle paths in the Netherlands were legally protected by the 1905 Road Law. I found this letter when I did research for an earlier post about the history of cycle paths in the Netherlands. It proves that at some point in history Dutch cyclists had the very same problems many cyclists in the rest of the world still encounter today, but the Dutch have come a very long way since. It is a pity that experience and expertise isn't taken advantage of more often. 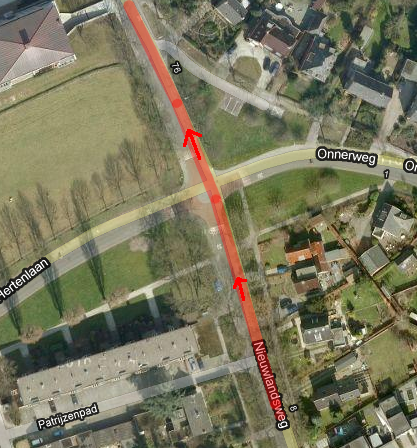 Maybe someone can inform me what the cycle path on the Overtoom is for. I myself do not know. Yesterday evening I had cycled in Vondelpark the best of an hour. I exited through the gate at Schinkelhaven and around 7 pm I proceeded along Overtoom. The first thing I saw was a barrow on the cycle path, that, despite my ringing didn’t even get out of the way. A few yards down the road two police officers were having a pleasant chat. While I rode past them I asked whether this path was for cyclists or for barrows and police officers, to which I think they responded with laughter. After I passed six unattended barrows, parked against trees on the cycle path, I ran into dairy cart number 3066, of which the driver was at the door of a home serving a maid. A little down the road is a dairy. Three of its carts were on the cycle path. A while later there was baker's cart number 4H52, the driver of which was doing the same as the driver of dairy cart 3066. Then there was a carriage of the city sewerage system, left standing right across the path. Thus far pedestrians had at least got out of my way when I used my bell, now two gentlemen and ladies were walking on the path in front of me who refused to move aside. I hit them. Wasn't the Overtoom wide enough they had the nerve to ask me. I tried to inform them that this path was meant for cyclists but they wished to walk where ever they pleased. I was called names, was grabbed by the arm and they threatened to kick my bicycle if I would run into them again, because they wished to continue their walk on the cycle path. I followed them until Leidseplein, hoping to see a police officer to make a point, even lodge a complaint, if necessary (no officer was in sight and in Leidsestraat I counted six). Let me also inform you that next to the cycle path one can find a wide pavement and next to that a very wide sidewalk. PS. Maybe the following plan would be of any use. I request names and addresses of some gentlemen cyclists who are inclined to accompany me at a dozen nights cycling along Overtoom. So we can note all license plates of carts, barrows etc. and try to get the owners or drivers prosecuted. Maybe this will also work against pedestrians unwilling to stay out of the cycle path. For some time, I've wondered why it is that British politicians and commentators look so very often across the Atlantic to the United States for inspiration, when they could more profitably take a much shorter journey across the North Sea to the Netherlands or other European nations to find better solutions for their problems. This is particularly true when it comes to cycling. A great example of this appeared recently in the "bike blog" of The Guardian newspaper in Britain, with the rather hyperbolic headline of "How one New York bike lane could affect the future of cycling worldwide". Cyclists in the USA, and at this time particularly in New York face many problems. I'd of course like to see them resolved. But my question in this post is about why it is that a British newspaper would make such a remark. Is New York really so significant in cycling terms ? 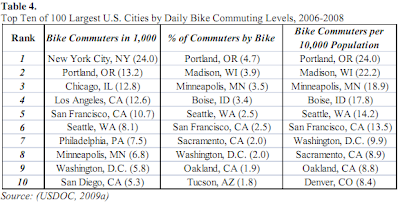 The last figures I saw for the cycling rate of the city suggest that just 0.6% of commutes in the city are by bike (and that this small number is enough to put it in sixth place amongst larger American cities). Only around one-fifth of all journeys made are for commuting purposes. However, commuting figures are often quoted for cycling because commuters are by definition adults of working age - a relatively easy group to attract to cycling. By concerning ourselves only with commuters we don't have to concern ourselves with the more tricky demographic groups - including children, parents accompanying children and older people. Commuting figures are usually the highest figures for utility cycling that you can quote, and it makes it easier to claim a larger modal share than is real when the entire population and all reasons for journeys are discussed. In this case let's be generous and assume for the sake of simplicity that 0.6% of all journeys by everyone are by bike in New York. The city has a population of around 8.4 million, and it's normal for people to make an average of around 2.5 journeys per day. Therefore, about 21 million journeys will be made per day in New York. Taking our generous estimate of cycle usage, we can assume that there are around 125000 journeys made per day by bike in the city. If this blog was into baffling with large numbers, I'd perhaps stop there and report the huge number of cyclists. However, that's not really very helpful. Even compared with London, where The Guardian is based, this isn't actually impressive at all. London's population is a little smaller than New York's, but Londoners reportedly use bikes for roughly 500000 journeys per day (only a small minority of these journeys, around 13000, are made on bikes which are part of the much hyped, incredibly expensive bike share scheme). In comparison with cities in the Netherlands, the number of trips made by bike in New York is roughly equal to a city with a population of around 150000 people and a merely average cycling rate. Higher cycling rate cities do better, of course. Assen, where we now live, is a tiny place with just 65000 people. However, they make over 70000 cycle journeys each day, which is a remarkably high proportion of our generous estimate for New York. The world's highest cycling rate is in Groningen, where a population of 190000 makes over 300000 journeys per day. Easily more than double the numbers made by New Yorkers. Other American cities are similar. Even the much lauded Portland has only a 4.7% commuting rate. That's around 1/6th the cycling modal share of an average Dutch city. No place in the Netherlands has such a low modal share as Portland, yet Portland is also frequently an inspiration to some people in the UK. Cycling infrastructure in the Netherlands is built to cope with far higher levels of usage and by a far wider demographic than many outside observers realise. But this blog post isn't really about New York or Portland or even about infrastructure. Rather, I'm interested in the British media's obsession with everything from America, and their apparently unquestioning belief of any hype or "cheerleading" which they hear. If you consistently look in the wrong direction, then you consistently end up with the wrong answers. That is, unfortunately, precisely what keeps happening in the UK, where it appears that many people stand with their backs to Europe and gaze longingly across the North Atlantic for inspiration for ways to solve any given problem. And does the Guardian also write about Groningen, the place which has the highest cycling rate in the world ? Well, search for "Groningen cycling" and you find a mere 29 hits, more than one of which are due to the comments I used to make beneath "bike blog" articles before seeing how utterly pointless it was to bother with them. There's surely something wrong with this picture. There's a saying about Journalism: "if your mother says she loves you, check it out.". Why is The Guardian, a "quality newspaper" not checking-out the stories that they tell about cycling ? Why are they not more skeptical of their sources, and ensuring sensible coverage of cycling ? The journalism on their "bike blog" often seems to consist of little more than reproducing press releases from whoever shouts loudest about their cycling "successes". The Netherlands has a smaller population than the Metropolitan area of New York City (16 million vs 22 million) but there are vastly more cycle journeys here. A million cycle journeys per hour, in fact, during much of every week. It may not be easy to see what this compares with, but there's one simple comparison which is startling: The tiny population of this country make more journeys by bike than the whole of the USA, Britain and Australia put together. When looking for examples of successful policy to copy, does it not make most sense to look where policies genuinely have been successful instead of looking to where proudly claimed successes are actually rather small and only visible relative to even smaller numbers of cyclists previously ? When Americans visit Dutch cities, there is a reason why they are amazed and inspired. If journalists from the Guardian were to make the same journey, they'd see the same things. I have suggested this to them before, and indeed I also sent invitations to journalists with this and other newspapers in the UK over some years with trying to promote the idea of a Study Tour to them. I'm still waiting for a response. Yes, there are just 24000 bike commuters in the whole of New York City. Within the US, Portland leads for overall cycling rate. However, even here the figures are remarkably small in comparison with any Dutch city - including even those which consider themselves to have low rates of cycling. It's great that progress is being made in the USA, but it's very slow progress and other nations would be better off looking to the Netherlands for real examples of what really does work to promote cycling. In the last week we've made four different posts which refer to the USA in one way or another. To make it easy to see all "USA" posts, you can select those posts by label. Please don't get any silly idea that I dislike New York, New Yorkers, or Americans in general. How could I ? New York's and New Yorker's influence on western culture has been huge. I grew up listening to Talking Heads and Suzanne Vega, and watching films by Woody Allen. However, just as it would make no sense at all to ask the Dutch about running a successful mission to the moon, it makes no sense to ask Americans how to make cycling a normal part of everyone's lives. That goes double when you see that enlightened Americans are actually looking to the Netherlands. Once upon a time, America was the leading cycling nation, but at the moment cycling in the USA faces many problems. I'd like to see them resolved. Do you want to see how different it could be ? Book a study tour and see how Dutch infrastructure has lead to the highest cycling modal share in the world. The same spot two days later. Not the same cars or drivers. This Thursday I had my first "road rage" incident since we moved here nearly four years ago. It's taken that many years, and about 40000 km of riding for one slightly unpleasant thing to happen to me. I used to expect it far more frequently in the UK. On my commute, there is only one place where this could happen. Haren. This small town, just south of Groningen, is famous for its Shared Space, and I've also written before about how drivers ignore the speed limit on the very road where the incident occurred. The back roads have 30 km/h speed limits, but they are not arranged so that they are especially inconvenient for drivers to use as through routes. As a result of this, they have become de-facto main routes for drivers avoiding the Shared Space. Almost no drivers adhere to the speed limit. I was riding along Nieuwlandsweg at 36 km/h. This is well above the 30 km/h speed limit, but I've become accustomed to being overtaken by almost all cars here whatever speed I ride. As I approached the junction with Hertenlaan and Onnenweg, I could see a car in my mirror which was rapidly approaching from behind. When I got to the junction, there was traffic coming from the right which I had to give way to (that's the law - everyone gives way to the right). The first of these vehicles was a tractor pulling a trailer, and it was was followed by two cars. Due to having stopped, the car behind me caught up with me and stopped right behind me. When the vehicles from the right had made their turn, I set off and almost immediately was close behind the second car. It turned out that the tractor was doing a maximum of 28 km/h and all of us were following it at this low speed. This didn't stop the driver behind me from becoming impatient and trying to overtake, but it was impossible so instead he/she went into the middle of the road, got 3/4 of the way past me and then started tooting the horn. I got in front and rode as close as possible to the centreline at 28 km/h (the speed of the cars and tractors in front of me) until first the car behind turned off to the left and sped down a side-street in the general direction of the shops and offices, and later on the cars and tractor in front turned down other side roads and I could get back up to a normal cruising speed. As these things go, it was actually very minor. I wasn't crashed into or pushed off the road deliberately, nothing was thrown at me, no-one punched me. After I made it clear that I was staying where I wanted to be, the driver pulled back and didn't follow excessively close behind. However, these things which I've mentioned all happened to me when I lived in Britain, and they all happened a lot more often than once in every 40000 km of cycling. By comparison, cycling here has been miraculously free of hassle from drivers. However, that's not because Dutch people behave particularly differently when behind the steering wheel of a car. As this incident shows, put people in the same situation and they behave in much the same way. 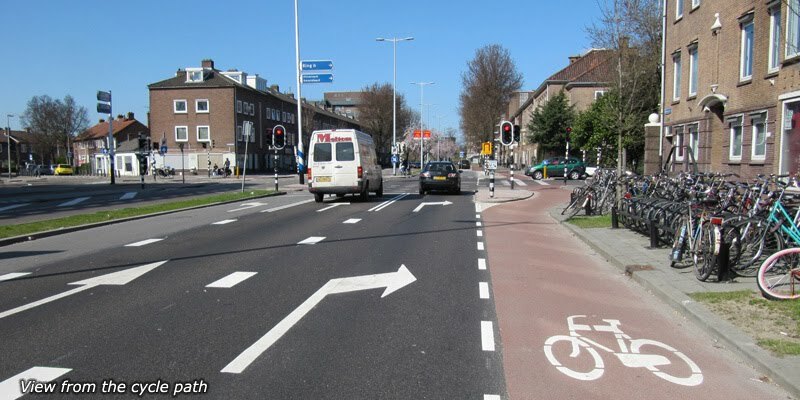 In general, Dutch road designs call for design to be obvious so that correct, safe behaviour becomes the way that people will naturally drive. This incident occurred in a rare place where drivers and cyclists are crushed together, creating conflict. I've long believed that the main reason why conflict between cyclists and motorists is rare in the Netherlands is that we exist mainly in parallel universes, and rarely have to directly interact. As a cyclist, either you're on a cycle path, or you're on a road which doesn't have cars on it. This rare exception shows how it should not be done. Please note that this blog post has caused considerable confusion. It does not recommend a design, and the sketch presented is not supposed to be a guide for other countries to use to design their traffic lights. 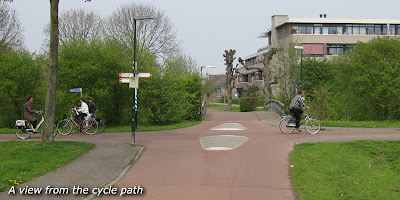 The design shown here has in some circles become known as "a standard Dutch junction" but was not the intention of this blog post and is a myth. Other blog posts show the multitude of different designs of traffic light junctions which are really used in an average Dutch city. 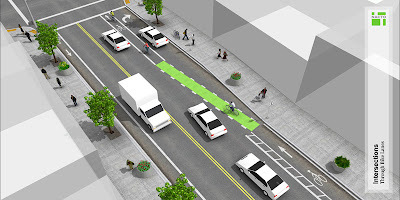 An association of transportation experts of 15 major US cities (NACTO) recently published new guidelines for bicycle infrastructure. They claim they are ‘innovative’ and ‘state of the art’ and based on ‘an extensive survey of expert knowledge, [and] existing guidelines from countries and cities around the world’. 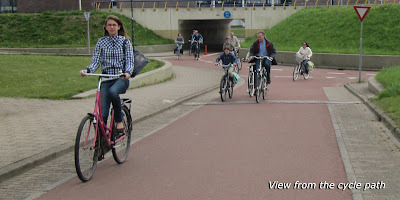 Some US planners do indeed visit the Netherlands to look at Dutch cycling infrastructure as David reported in yesterday’s post. But looking at the new NACTO guidelines we doubt they have too. Just focusing at track widths we read on the NACTO website: "desired width for a cycle track should be 5 feet. In areas with high bicyclist volumes or uphill sections, the desired width should be 7 feet". This is actually very narrow, 5' = 1.5 m and 7' = 2.1 m. The standard width for one way cycle paths in the Netherlands is a minimum of 2.5 m ( 8'). Wider ones are not uncommon. 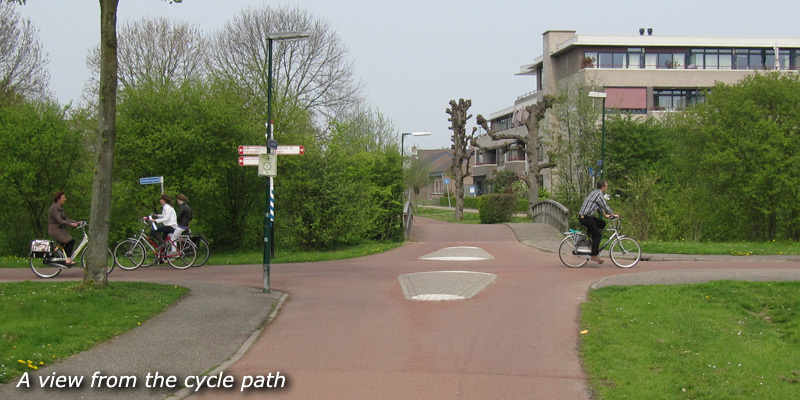 For bidirectional use the minimum is 3.5 m (11 '), but most modern cycle paths are 4 m (13 ') or more. Although Dutch sources like CROW are quoted as references the Dutch standards were certainly not adopted. The biggest problems with these guidelines lie in the intersection designs. For instance, NACTO states "typical international best practice is a two-stage turn". We couldn’t disagree more! The shown queuing boxes are a terrible solution. They not only slow cyclists down but put them in a very dangerous position in the middle of the junction where cyclists have to wait while motorised traffic passes on all sides. This is something that you will never see implemented in the Netherlands! The advised construction of ‘bike lane / turn lane’ is a way to maximize conflict between cyclists going straight on and drivers turning right. Again, this is something you very rarely see in the Netherlands. This type of design was tried, tested and deemed undesirable. The Dutch stopped building lanes like that a long time ago. A few do still exist (I know just one remaining junction approach like that in Utrecht) but they are phased out as soon as possible. Junctions like that seem more usual in Denmark and David has already criticised one such junction in an earlier post. So what then is the Dutch solution for the junction approach? 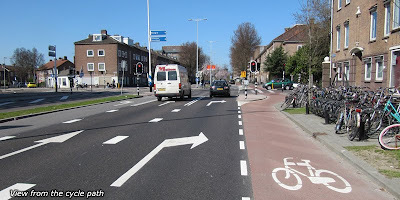 Where is a Dutch cyclist positioned on a junction and how do the Dutch create a safe left turn? The Dutch standard junction design solves all those issues at once. So you can ask: would this solution at all be possible in other countries? We believe it is and with the help of the NACTO drawings including their advised widths of car turn lanes we were able to create an animation of a Dutch style junction in the US situation. If anything, this animation makes clear the space is there! But what's far more important: this type of junction eliminates conflict in turning and crossing movements far better than the advised solutions. So we question where NACTO looked for this "European best practice" which is actually nothing at all like what is implemented in any city in the Netherlands. However, of course "Europe" is not one place, and to talk of copying "Europe" is rather meaningless. No other country has the same standards as the Netherlands does, nor does any other country have the same participation in cycling that the Netherlands does. As David would tell you: "copying 'best practice' from the UK, for instance, would get you no-where at all". Cyclists can always turn right on a red traffic light, and are protected from any interference from motorists as they do so. Motorists cannot make a right turn on red. Each cycle path is a minimum of 2.5 m wide, and conventionally they will expand in width at busy junctions, so there is space for cyclists to pass each other to make the maneuver. With or without cycling infrastructure, Dutch traffic lights avoid conflict in a way that those in other countries do not. Many traffic lights at a cross-roads in the UK and USA simply have two states. i.e. N->S and S->N are green simultaneously while W->E and E->W are red and vice-versa. Drivers can go straight on, left or right and those approaching in opposite directions will have to cross each others' paths. However, in the Netherlands it is normal for the turns to have their own traffic lights which have different timings so that conflict is avoided. Synchronization with cycle path traffic lights works in the same way, maximumizing throughput while keeping danger at bay. When motorists have a green light for going straight ahead, cyclists also can ride straight ahead without right or left turning motorists having permission to cross their paths. However, when motorists are given a green light for a right turn this is separated in time from the cyclists' straight on green so that conflict is avoided. You may sometimes have to wait twice to make a left turn. However, you don't have to wait at all to make a right turn. On average, this cancels out and cyclists are not disadvantaged. At the other popular design of crossing, with simultaneous greens for cyclists, who go in all directions at once, you still can make a right turn at any time, and only ever have to wait once to make a left turn. Cyclists then have an advantage over drivers. In general, the timing of traffic lights does not disadvantage cyclists on the cycle path. In fact, in some instances, cyclists get a green light twice as frequently as drivers do. This is only possible to do if the modes are separated and have their own traffic lights. Please note that while this is referred to as a "standard" junction design in Mark's text above, the word was used to mean "unexceptional", not to indicate that this is a standard which is worked towards. Junctions which exactly resemble this design are not actually common in the Netherlands. Only one junction in Assen closely follows this design and that's already planned to be replaced with a more modern and more convenient (for cyclists) design as used in the rest of the city. It appears that several members of the consulting team responsible for the NACTO design standards work for the same company as was responsible for both the lacklustre design standards for Ontario and the inadequate plan for Los Angeles. Better "experts" than this need to be consulted if progress is to be made. It appears that NACTO took these criticisms on the chin and are adopting a design of junction very similar to Mark's sketch above. However, you must be very careful that it is not over-applied. This design needs to be one of a range of solutions, amongst better solutions, not the solution or the best solution that you have alongside lesser solutions. See Examples of Dutch Best Practice: Green for cyclists in all directions, when is separation needed, how much separation is disirable and safer junction design. Riding in the Netherlands from Bikes Belong on Vimeo. Bikes Belong in the USA recently visited the Netherlands on a study trip and produced this film as well as an article entitled A Week of Biking Joyously. On the resulting blog posts says of the statistics which surround cycling in the Netherlands that: Upon hearing these statistics it’s tempting to casually dismiss the entire Dutch cycling experience as irrelevant to our own, as if some exotic alien technology beyond our comprehension were responsible. I’m no biologist, but I’m pretty sure there is no unique bicycling gene only present in Dutch nationals that compels them to ride bikes way more than anyone else. On the contrary, most of the factors that enable high levels of bicycle use in the Netherlands can be traced to deliberate (and replicable) human decisions. Consistent investment in high-quality infrastructure over the past four decades, policies favoring compact and diverse land use, comprehensive traffic safety education, economic and legal incentives; all of these work together make bicycling the fastest, easiest, cheapest and most logical way move around for short trips. You’d be crazy not to ride a bike. They also wrote other things after their return, such as how they'd seen bicycling being normal and how bikes are the right tool for the job, and there is also a very attractive presentation about the visit. There is much work to be done in normalizing cycling in the USA. We have to hope that these people will help to keep the country on the right path.